Does your copy fall flat? Would you like to write with the punch and verve of your favourite writers? I trained as a journalist nearly 15 years ago. The two courses I took taught me everything I know about using powerful words. Over the coming weeks I’ll be sharing the lessons I learnt, and still use every day. 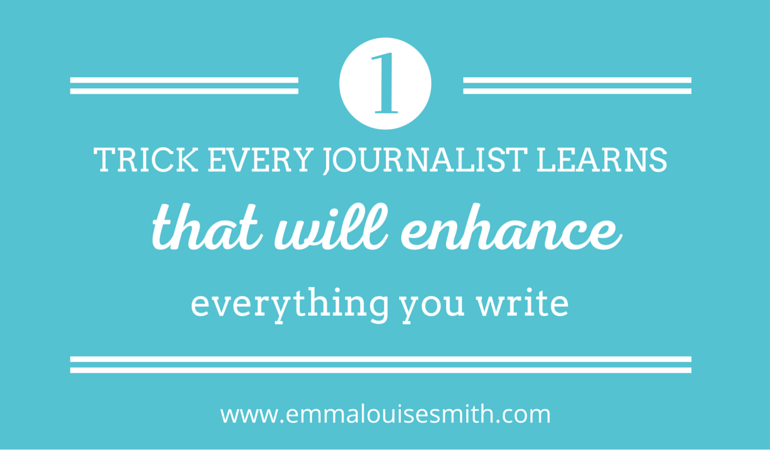 Today I’m going to share one the writing trick that will add the energy you’re missing to everything you write. It’s rather simple. Too many writers think lots of adjectives add substance and style. They don’t. Adjectives clutter your prose with unnecessary words that obscure rather than enhance your meaning. Good writing, journalistic or otherwise, depends on clarity. Like a newspaper, if your blog or website – doesn’t capture a reader’s attention immediately they will turn the page or click away. Simplicity is the golden rule. Whatever you are writing should be clear, easy to understand and easy to read. I was taught that if a sentence can’t be understood on the first reading, the fault is with the writer not the reader. The problem with adjectives is they are often lazy, vague and pose more questions than they answer. Unless they are specific, and vital to the story, they add little. With the golden rule of simplicity in mind, every word your write must earn its place. Most of the time adjectives don’t. Which sentence is a better description of this scene? The girl stretched her arm and stood on the tips of her toes but the shelf was out of her reach. In the first sentence the adjectives ‘small’ and ‘high’ tell us very little and leave us wanting more information. How small? How high? The words don’t show us a picture. The second sentence enables us to picture the scene in our minds and without any adjectives describes the scene more effectively. So how should you write great descriptions? Use interesting, strong nouns and verbs eg. ‘The girl stretched her arm’ above. Specific, concrete words are easier to read and strike a more powerful note with readers than general or conceptual words. Concrete language is powerful language. So if and when you do use an adjective make them specific eg. the ‘green and blue dress’, not ‘the colourful dress’. The feature writing teacher on my journalism course gave us this exercise to test our powers of observation and ability to write descriptive pieces. Try it. ‘Smoke hung in the air of the cafe. It’s lunch time and people come in and out, ready to relax. Notice the difference in your writing compared to how you write normally. You should find there’s life in the words you’re written, and an energy that takes you into the story by showing not telling. Find the most recent blog post or article you’ve written. Highlight all the adjectives. If the word is relevant and adds something to the information you are giving, leave it in. If it doesn’t, delete it. Your article will be better for it. Thanks for being my very first commenter Rebecca! So glad you found it useful. It’s amazing how much tighter and clearer your copy gets when you lose a few offending adjectives! I’d never really thought of adjectives that way! Good tips. Thanks for sharing. Glad you found it helpful Mark. Thanks for reading. Let me know how you get on with culling the adjectives! Such a helpful post Emma! I’ve never heard anything like this before. Mind expanded. I already feel like you’ve made me a better writer! Thank you!! I remember in high school having to go through English papers and edit out all the “be” verbs to get rid of passive voice. While it was cumbersome at the time, it was such a great practice in making sure to use really strong verbs instead of relying on what was easy. I feel like this is something that goes along the same lines, but it’s a rule I don’t think I’ve ever heard of before! It makes so much sense though. I love how clear it is in the examples you’ve given. Buffering! Thank you Megan 🙂 Yes you’re right, it’s the same idea, and banishing the passive voice is another trick I was taught as a journo – but it’s rife in the corporate world. Love that as entrepreneurs everyone is striving towards active, lively, personality filled copy, but when pushed for time t’s easy to fall back on what has become habit. It makes such a different when you stop, think and mix things up a bit. Try the exercise, you’ll see the difference in energy straight away. Excellent VK. Enjoy! You’ll definitely notice a massive difference when you try the exercise. Brings copy to life!